Son of Eliab, one of the conspiratorsagainst Moses (Num. xvi. 1; Ps. cvi. 17). Deut. xi. 6 places him in the tribe of Reuben. Abiram—who obtained his name from the fact that he fled from God—belonged, together with his friend Dathan, to the quarrelsome and seditious personages in Egypt and in the wilderness who sought, on every occasion, to place difficulties in the way of Moses. Being identified with the two Israelites at strife who were the cause of Moses' flight from Egypt (Ex. ii. 13-15), the two were thus regarded as having interfered with him at the beginning of his career. Later, as punishment for their wickedness, they became poor and were degraded in rank; yet they did not cease their hostility to Moses, and opposed his first endeavor to deliver Israel. 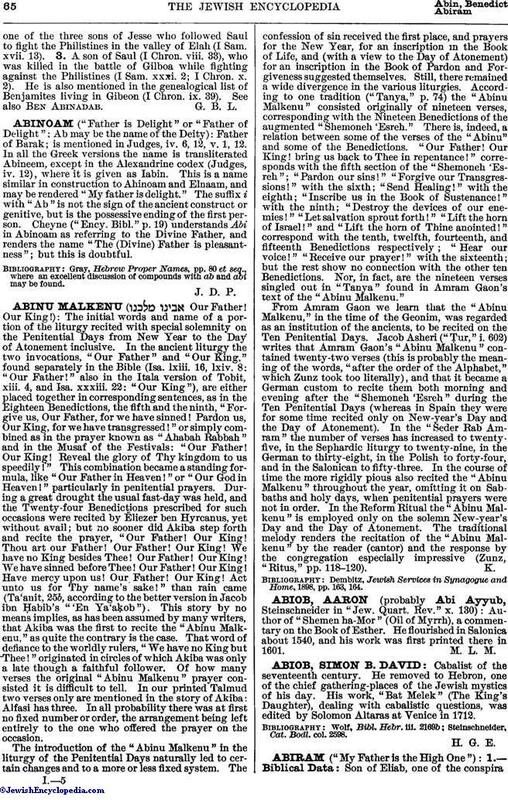 It was Abiram and Dathan who were the immediate cause of the bitter reproaches made to Moses and Aaron recounted in Ex. v. 20, 21. When, despite this, the exodus from Egypt took place, Dathan and Abiram tried to induce the people at the Red Sea to return (Ex. xiv. 11, 12); and in the failure of this attempt, they made an effort, through disregard of Moses' commands, to incite the people against their leader—Ex. xvi. 20 being applied to them—until they thought they had a following sufficiently numerous to risk the great rebellion under Korah. 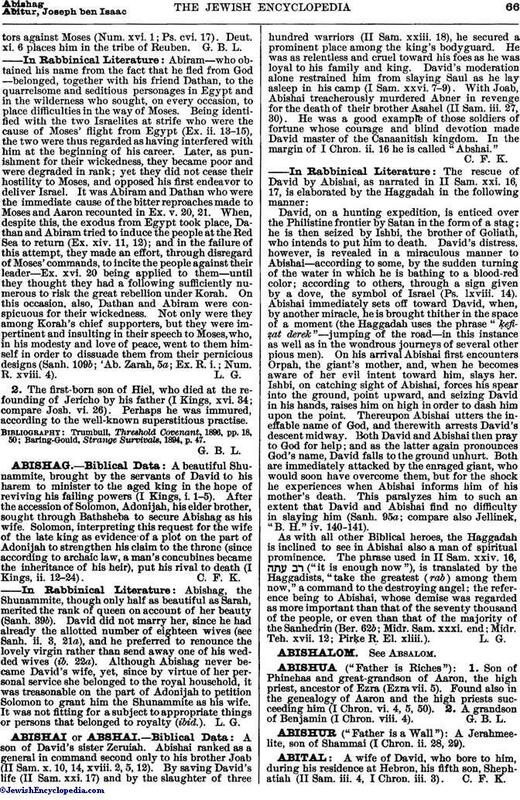 On this occasion, also, Dathan and Abiram were conspicuous for their wickedness. Not only were they among Korah's chief supporters, but they were impertinent and insulting in their speech to Moses, who, in his modesty and love of peace, went to them himself in order to dissuade them from their pernicious designs (Sanh. 109b; 'Ab. Zarah, 5a; Ex. R. i.; Num. R. xviii. 4). 2. The first-born son of Hiel, who died at the refounding of Jericho by his father (I Kings, xvi. 34; compare Josh. vi. 26). Perhaps he was immured, according to the well-known superstitious practise. Baring -Gould, Strange Survivals, 1894, p. 47.